Description: Shankar (Dharmendra), Vijay (Vijay Arora), and Ratan (Tariq) are three brothers. On their father's birthday, their mother taught them a song titled "Yaadon Ki Baaraat" which they held dearly to their hearts. As fate may have it, one day, the boys' father witnessed a robbery by Shakaal (Ajit), and his henchmen. To protect their identity, Shakal decided to kill the boys' father before he could go to the police. So one night, Shakaal and his men storm into the boys' father's room and kill both their mother and father. Shankar and Vijay witness the act and flee. They make their way to a passing train, where Shankar is separated from Vijay. Several years pass by and the boys have grown up. Shankar is haunted by the memory of his parent's murder and is now joined by his friend Usman on a crime spree around the city. Vijay was adopted by a fairly wealthy man who is the grounds keeper to the love of his life, Sonita (Zeenat Aman) And Ratan, was raised by the boys' maid, and changed his name to Monto. With his new identity, Monto started a band and does gigs a hotels for a living. 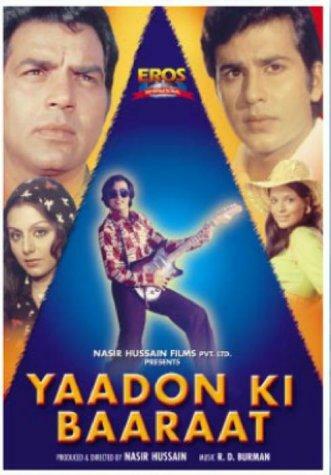 Their only hope of reuniting is by remembering the song their mother had taught them... Yaadon Ki Baaraat.Shankar (Dharmendra), Vijay (Vijay Arora), and Ratan (Tariq) are three brothers. On their father's birthday, their mother taught them a song titled "Yaadon Ki Baaraat" which they held dearly to their hearts. As fate may have it, one day, the boys' father witnessed a robbery by Shakaal (Ajit), and his henchmen. To protect their identity, Shakal decided to kill the boys' father before he could go to the police. So one night, Shakaal and his men storm into the boys' father's room and kill both their mother and father. Shankar and Vijay witness the act and flee. They make their way to a passing train, where Shankar is separated from Vijay. Several years pass by and the boys have grown up. Shankar is haunted by the memory of his parent's murder and is now joined by his friend Usman on a crime spree around the city. Vijay was adopted by a fairly wealthy man who is the grounds keeper to the love of his life, Sonita (Zeenat Aman) And Ratan, was raised by the boys' maid, and changed his name to Monto. With his new identity, Monto started a band and does gigs a hotels for a living. Their only hope of reuniting is by remembering the song their mother had taught them... Yaadon Ki Baaraat.